Kathy was just 15 when she was discovered in the audience of The Wink Martindale Show, a daily LA teenage dance program. "A Thousand Stars in the Sky" was her all-time biggest hit, and also her only Top 25 single. Kathy Young was born October 21,1945, in the Community Hospital in in Santa Ana, California. Her family lived in the nearby town of Orange. Her father was an electrician that worked at the Studebaker plant. He mother a homemaker. By the time Young was two, the family was living in Long Beach. Her mother played guitar and was choir director at the Bellflower Christian reform Church. early on, Kathy was given a guitar and joined choir before she was in her teens. In Long Beach, she attended Hamilton Junior High. In the eighth grade , her best friend Myrna Wilson, signed her up for the annual talent show. stage shy, a condition that persisted for years, Young won the show. That automatically put her on the the next year's program, which she won too. One weekday afternoon in the late summer of 1960, the girls group Young belonged to visited the Dance Party (similar to American Bandstand) hosted by Wink Martindale. The guest were the Innocents, a local trio with "Honest I Do" on the new Indigo label. Fascinated by the Innocents, Young introduced herself while they were signing autographs, asking how to go about making a record. Jim Lee, the Innocents manager, gave her his phone number and told her to call when he had more time. Instead of calling right away, Young went home and practiced for three months. Knowing of her desire to record some demos, the girls' club was working to raise the necessary $225 to hire a studio band and book three hours of time. Young now phoned Lee and he told her to come in and see hi. . Unfortunately, Kathy suffered a concussion in a swimming pool accident. In the meantime, the Innocents were enjoying success with their first release "Honest I Do." 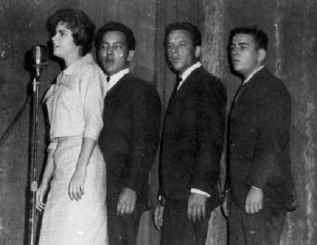 The Innocents formed in the late 1950s as the Emeralds. the group consisted of Darron Stankey (born July 5, 1942), Larry Tamblyn, frank Zworkin and Wayne Edwards. After a year without success most of the originals were gone. Stankey recruited Jim west (born January 1, 1941), Al Candaleria (born March 7, 1941) and Larry Knew. All three of the new members were from the southern suburbs of Los Angeles. Now known as the Echoes, they were hired to sing background for Alpert's producing sessions for Andex Records. Their first work was singing behind an obscure female artist on "Time." Shortly thereafter, Larry Knew left. When Alpert was late for an appointment one afternoon in June, 1960, the boys walked down the street to the Hollywood recording Studios, where Kim Fowley and Gary Paxton were in house producers. They auditioned with "Honest I Do," impressing Fowley enough to set up a session later that day. Within days the newly re-named Innocents were signed to a production deal and a recording contract with Indigo Records. Almost immediately, "Honest I Do" was picked as a hit by two of the most powerful radio stations in Los Angeles. At this time, Jim Lee worked for a local record distributor and was learning the ropes at Indigo. Soon he was the Innocents manager. "Honestly I do" was released nationally in the second week in July. It was selling so well in Los Angeles that they were invited to appear on American Bandstand on July 29. With this national exposure, three weeks later "Honest I Do: began climbing the charts, eventually reaching the Top Thirty. Meanwhile, it took Young three weeks to recover from her accident. When she finally called Jim Lee, she was near the end of her summer vacation from school. Arranging to met Lee at a recording studio the next afternoon, she and her mother arrived as the Innocents were finishing. Young went through an official audition and was given the remaining studio time to record. Young had many songs she had written, but Lee was more interested in her recording "A Thousand Stars," which had been a minor R&B hit for the Rivileers in 1954 on Baton. Young ran through it a few times to familiarize herself with the lyrics. Then minimal instrumentation, snare drum and muted lead on electric guitar.was added, but Lee . After several takes, even with Young playing acoustic guitar and heavy echo, the sound was sparse. Lee suggest that the Innocents provide some light vocal backing. This time, when they reached the end, they knew they had something special. Though "A Thousand Stars" was long by the contemporary standards of rock and roll, that didn't seem to deter deejays from playing it. "A Thousand Stars" blasted its way into the Top Ten reaching #3 Pop and #6 R&B. Young was enrolled in Jordan High School in early September. Even with schoolwork, she did requests for local appearances. Her first professional appearance was Wink Martindale's Dance Party. When the offers to perform across the country started to pour in, Young's parents placed her in the Hollywood Professional School. This allowed her to pursue a singing career and continue her education by correspondence, if necessary. The Innocents continued to record their own records and "Gee Whiz" was released in October. At the same time "Tick Tock" from an earlier session was released to capitalize on the Innocents fame. Before the end of the year the Innocents released "Kathy" as a tribute to their singing partner. Over Christmas vacation, Kathy and the Innocents few to New York for their first major live performances. First they videotaped an appearance on NBC-TV's Merv Griffin's Saturday Prom to be aired on December 24. A day earlier they began twelve days at the Brooklyn Theater Rock and Roll Spectacular.
" A Thousand Star" sold a million copies. The follow-up, "Happy Birthday Blues" varied only slightly from "A Thousand Stars>" Released in January 1961, it made it into the Top Thirty. Her next single "Our Parents Talked It Over" didn't do well, but "Magic Is the Night, released July, 1961 made the Pop charts. This was to be Young's last national success. Her next release in November 1961, was "Baby, Oh Baby." Like so many other small companies with big hits, Indigo was floundering in red ink. Having gone deeply in debt t press millions of records they were having problems collecting from the regional and national distributors. In 1962, Jim Lee and Joel Scott Hill Founded Monogram Records, to showcase Lee's latest discovery Chris Montez. In February, 1961 one they released Montez's "All You Had To Do (Was Talk To Me" and "Let's Dance in July. Kathy Young's "Dream Boy" was Monogram's next release after "Let's Dance." There were three more releases on Indigo in 1962, all previously recorded material: "Time," "Lonely Blue Night" and "send her Away." All but the last featured the Innocents and none sold well. In 1964, Young was backed with Monogram for two singles and both were g duets with Montez. When Kathy Young recorded "A Thousand Stars" she was not yet fifteen. During her greatest popularity, school work took precedence over her budding career. One weekend in February, 1961, she appeared with Freddy Cannon and Mark Dinning at several March of Dimes benefits a Philadelphia high schools. Young appeared on American Bandstand several times. During the summers she toured with packaged shows. On June 25, 1961 she and the Innocents were at a rock and roll show put on by Alan Freed at the Hollywood Bowl. The Innocents moved to Reprise Records. In 1962, Reprise release three singles, but all appear to be the same with either a different number or flipside. None received adequate promotion and the Innocents were soon making plans to move to another record company. In July, 1963 Decca issued "Don't Cry." "My Heart Stood Still" was released by Warner Brothers in 1964, before the Innocents disappeared and disbanded. In the spring of 1966. Stankey. and Candaleria with former Innocent Larry Knew started Sugar Beats Records. In December 1964, Young met John Maus while he was working with the Walker Brothers at the Pandora's Box in Los Angeles. Working for three nights at the club the Walkers backed her up. It was love at first sight and Young and Maus were wed in Los Angeles in June. The marriage was kept secret for six months. One the marriage was announced, she settled down to a life filled with friends like the Beatles, the Rolling Stones and the Animals. For four years she remained in England. In 1968, with her husband constantly on the road she took up modeling. A year later the marriage ended in divorce and she returned to Long Beach. She became a claims adjuster for a local branch of AAA and began attending Cerritos Junior College. I 1971, she remarried and moved to Lindsay in central California. She had two children, a daughter Ali and a son Josh. She also worked as a representative for the Sunkist Corporation. This marriage lasted for twenty years, but it too ended in divorce with Young returning to Los Angeles. For the previous ten years Rip Lay of Sunfire Records had been searching for her to persuade her and the Innocents to allow his company to release a combined hits album. Starfire also released a single featuring Kathy and the Innocents, "Please Love Me Forever" b/w "sparkle and Shine." In the early '90s, sued Indigo trying to gain control of her material. Feeling she had never been adequately compensated for her sales, all she was able to receive after long litigation was a part-ownership of a worthless company. She won the rights to her songs, but there were no mastertapes from which she could release a greatest hit package. In October, 1993, she performed at the Legends of Rock and Roll Show at the Greek theater in Los Angeles. This led to a similar show at the Meadowlands near New York City. Today, Kathy Young lives in Los Angeles and works for Sunkist. She is a dedicated jogger and competes in the annual Los Angeles Marathon. At the start of 1960, Indigo records was just another obscure West Coast indie with ambitions that were no more likely to be fulfilled than any other one room operation. Yet by the end of the year Indigo had notched two Top 20 hits by the Innocents, a smooth harmony trio, and a third hit "With A Thousand Stars" by 15 year old Kathy Young who was discovered by Indigo producer Jim Lee in Los Angeles where she was born in 1945. Lee teamed her up with the more experienced Innocents. The Innocent's had a hit with "Honest I Do" and were signing at a Wink Martindale TV show when Kathy Young came up with her mother and told them she could sing. Jim Lee invited her to come to the studio the following week for an audition. Young showed up with her mother and it was decided that she was to sing "A Thousand Stars," a 50s doo wop hit by the the Rivileers. Young did a couple takes, but something seemed to be missing. So the Innocents sang background. Together, Young and the Innocents had another hit with "Happy Birthday Blues." In 1965 at age 19, Young took a major step in a new direction - she married John Maus of the Walker Brothers. Soon after their marriage they moved to England where the Walker Brothers found success sharing the top spot on the charts with the Beatles and Rolling Stones. In 1969 Young returned to the U.S. In 1971 remarried and for the next twenty years raised a family and helped manage their citrus ranch in Central California. In 1994 she returned to L.A. where she now works for a major international company. She also returned to her original passion - music. Since her return KATHY YOUNG has performed on numerous rock shows at some of the countries premier venues including the "Greek Theatre" in L.A. and the "Meadowlands" arena in New Jersey.